We would like to invite you to a workshop on the anthropological concept of infrastructures at the Global South Studies Center, University of Cologne, and its purchase in analyzing the ‘deep politics’ of globalization and its shifting topologies of value. The background for this workshop is a larger, interdisciplinary research initiative in Cologne that explores the making and unmaking of the Global South, where a focus on infrastructures is to provide one methodological access to processes of valorization and commodification (together with commodity chains). Politics is part of, or, indeed, built into infrastructures: infrastructures facilitate certain flows or linkages while blocking or unmaking others, they empower certain (kinds of) people while they marginalize others, they provide the grid for a new geopolitics, and they are materializations of a particular – social, economic, or political -- visions. Infrastructures are thus built to facilitate the formation of (economic) value as well as of (political, social, cultural, or religious) values; in other words, infrastructures are a source of particular (global) topologies of value. Moreover, modern infrastructures are themselves neither global nor local, they are both at the same time (and thus provide a particular research ‘access’ to globalization as a territorial practice). The workshop shall focus on infrastructures as a new theoretical or analytical concept in anthropology, on the particular “field” or perspective it gives rise to, as well as on its advantages for analyzing the formation of particular global territories and topologies of value. We plan for a rather informal, debate-centered workshop focusing on intellectual exchange and exploration. The workshop shall consist of two parts. In the first part, we would like to ask you for reflections on how ‘thinking through infrastructures’ has helped you to theorize ethnographic phenomena within your own fieldwork, as well as your thoughts on how a focus on infrastructures could add to a new (also a new ethnographic) perspective on processes of globalization. 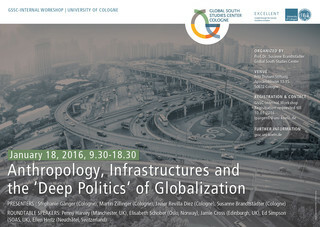 In the second part, members of the project group at Cologne will present their thoughts on how infrastructures could be used as an overarching framework to understand specific aspects of globalization in what is called the Global South (such as labour processes, the use of media, the commodification of natural resources, and investment chains).